Monday's county commission meeting offered stark contrasts-and some surprises. A word about keeping things in proportion: During Monday's Shelby County Commission meeting, the media contingent was a little denser than usual, and I, along with the other regulars, as well as the situational drop-ins, avidly awaited a promised showdown on the matter of a subpoena issued by lawyers for the commission seeking the identities of The Commercial Appeal's online commenters. That, and the election of a new chairman for 2012-13, a matter on which the commission had deadlocked two weeks earlier and which illustrated both the fragmented nature of the commission's various blocs and personalities and a weird sort of balance-of-power that had developed on the body, for better and for worse. And indeed, when the time came for deliberation on these issues, there was enough drama and suspense to attract the interest of political specialists and lay folks alike. But before any of that happened, there was a longish opening-period section of the agenda that concerned proposed amendments to Shelby County's Unified Development Code. Several of the commissioners weighed in on the matter at some length. So did such interested parties as Carter Gray, an assistant county attorney; Memphis Heritage director June West and her associate Mary Baker, formerly of the Office of Planning and Development; and proprietors of businesses ranging from the exotic to the ordinary, who were concerned about the effect of UDC revisions on their livelihood. Debates were conducted between those, on and off the commission, who wanted strict design standards applied to new commercial developments, and those, on and off the commission, who thought that any business willing to invest in new infrastructure during a time of economic slump should not be saddled with too many restrictions of any kind. Some amendments were accepted, some weren't. What got approved in the end was a previously arrived-at agreement on most issues, with "grandfathering" clauses and conditional licensing procedures easing the plight of some of the affected shop owners and zoning restrictions that aimed at hitting the middle between the attitudes of development-at-any-cost and aesthetic preservationism. The primary bone of contention Monday was over the matter of "administrative deviation," i.e., just how much latitude OPD planning director Josh Whitehead might have in allowing deviations in development plans. (For the record, Whitehead was not especially eager to acquire this latitude.) 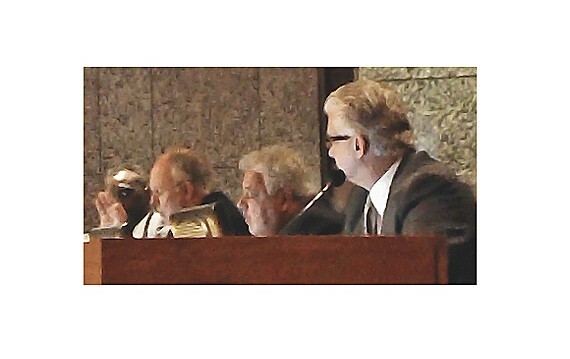 In the end, a compromise reached earlier by the Memphis City Council was accepted. During all of this time-consuming debate, the media representatives on hand, not excluding yours truly, mainly sat stoically, waiting for the expected high-profile debates and votes on the subpoena matter and the commission's leadership. By contrast, when the UDC issues were finally resolved, most of the audience in the commission auditorium got up and left, indicating what it was that interested them. It was a reminder of sorts of the late 1990s and early years of the current century, when a commission agenda, like its equivalents being considered by the city council, would be loaded up with development projects, and batteries of lawyers, along with combative citizens, would slug it out or negotiate out loud on a given meeting day. It was a reminder, too, of one of the central purposes of legislative bodies, perhaps the central purpose — that of providing guidance or ground rules or incentives or protection or approvals or prohibitions regarding nitty-gritty concerns of everyday life. • Finally, though, the media contingent got its moments of high drama. As scheduled, Terry Roland, the Republican store owner from Millington whose persona is equal parts maverick and party-liner, brought to the fore his two add-on resolutions — prompted specifically by the commission lawyers' subpoena served on The Commercial Appeal and more generally by the continuing resentment of the commission majority's opposition to municipal school districts on the part of Roland and other suburban Republicans. There were two resolutions: one that would formally withdraw the subpoena and another that would fire the Baker Donelson legal team, which is pursuing the majority's will on matters regarding the ongoing school-merger controversy. As it happened, Roland withdrew the second resolution upon the failure of the first one, which focused on the subpoena issue. In the end, the subpoena matter was resolved less on questions of the First Amendment, freedom of speech, and privacy — although all these concepts got a verbal workout — than on which side of the merger controversy a given commissioner happened to be on. In an irony which Roland and fellow District 4 commissioners Chris Thomas and Wyatt Bunker themselves noted, the supporters of the proposal to withdraw the CA subpoena, who also included District 1 commissioners Heidi Shafer and Brent Taylor, were those who had most often had occasion to criticize The Commercial Appeal. In Monday's debate, however, their stance was protective of the CA's right to keep the identity of its online commenters private and supportive of First Amendment rights in general. By contrast, such usual champions of constitutional liberties as Democrats Steve Mulroy and Walter Bailey were at pains to offer rationales for the actions of the Baker Donelson lawyers in serving the subpoena. Bailey was blunt about it: "We need to trust our lawyers." Mulroy, more conscious of a need to dance through this particular thicket, constructed more elaborate arguments, ranging from the fact, as he saw it, that comments people deliver in supposed privacy are more revealing than what they say for totally public consumption, to the hypothetical case of a capital crime, when surely everybody would want to unravel a potential culprit's identity, wouldn't they? In all honesty, the undeniably accomplished law professor seemed to work harder at making his case than he normally has to. Left moot for the most part was the issue of just what the attorneys thought might be gained, legally, from knowing the identities of anonymous contributors. As Brent Taylor pointed out, it is not illegal for racists to offer advice to legislators (taking for the sake of argument what may be the attorneys' best-case scenario for evidence they might turn up), nor is it necessarily incriminating for legislators to take their advice. In any case, result of the vote corresponded to the same sides that generally form on the commission in relation to any school-merger issue. For the record, the prevailing nay voters were Bailey, Mulroy, Mike Ritz, Henri Brooks, Melvin Burgess, Justin Ford, James Harvey, and outgoing chairman Sidney Chism. • The commission's chairmanship battle, which ended in the election of Republican Ritz, with Democrat Burgess as chairman pro tem, ultimately conformed to a textbook pattern of sorts. Ritz is no stranger to controversy, and he is more than willing to take strong positions, even if doing so turns out to alienate one side or another. Importantly, though, he is an equal-opportunity hardhead, faithful to his own sense of things and not to a party or factional line of any kind, and he knows how to unbend, too — as he did when, upon being elected, he promptly offered an apology to colleague Taylor for using over-strong language to characterize the elements of a Taylor redistricting plan some months ago. A former banker, Ritz is also widely respected for his financial expertise. Like Ritz, though in a much lower-profile way, Burgess keeps his own counsel and avoids being tied to rigid positions. And thus the two of them eventually prevailed as compromise candidates after a prolonged stalemate involving other candidates whose personalities or points of view had a tendency to polarize.